2CD signed limited edition AVAILABLE NOW ! 4th March 2013 will see guitar legend Gordon Giltrap and keyboardist Oliver Wakeman (following his years of touring with the classic progressive rock band YES) release their debut collaborative album 'Ravens & Lullabies' on the Esoteric Antenna label. "Ravens and Lullabies" is the result of a recent collaboration between legendary troubadour Gordon Giltrap and Oliver Wakeman, most recently to be seen in Yes. Some of you may have seen their charming gig for the CRS at the Wesley Centre last year. It also marks Gordon's return to extensive electric playing, while Oliver mixes his excellent synth leads with some delicious piano. and Arena singer Paul Manzi. "Fiona's Smile" is more along the lines of what I was expecting with acoustic guitar and piano weaving around each other, before the infectious "From Turn of the Cards" sung by Oliver's former Yes cohort Benoit David. Hereon, the tracks pretty much alternate between the acoustic -mainly duos, although each man has a solo piece - and excellent songs recorded with rhythm section Steve Amadeo and Johanne James. On the quieter vocal tracks Manzi is deliciously and unusually restrained behind Gordon's sensitive finger picking and Oliver's well-judged keys. However, two full-band tracks stand out - the 10 minutes out-and-out prog of "Is this the Last Song I will write" and the shorter but no less impressive "Credit Carnival". Both pieces ought to surprise and delight, with Gordon blending acoustic and electric textures and Oliver contributing swirling organ and synth pyrotechnics. And here's the thing. What might have been a tuneful and pleasant album has been transformed into something of genuine beauty and substance by real care over the quality of the material and the arrangements, and the undoubted enthusiasm of the two protagonists. Fans of the acoustic side of both men's past work will be kept happy, of course, but it is when the band kicks in that this album really flies, and it's particularly wonderful to hear Gordon unleash those trademark lead guitar lines as if it were 1978 all over again! This album has been well worth the wait.Right from the opening track "Moneyfacturing" to the closer "Ravens will fly away" it's a broad spectrum of virtuoso musicianship, great vocals and a superb rhythm section.This album should appeal not only to fans of Gordon Giltrap and Oliver Wakeman but should find a following of anyone who just likes well written and well performed acoustic/electric rock. 5* Review by RMD on Amazon.co.uk Electric Giltrap! 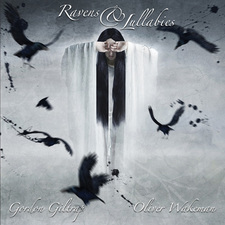 "Ravens and Lullabies" is a collaboration between Gordon Giltrap and Oliver Wakeman, the virtuoso keyboard player formerly of The Strawbs and Yes. Anyone fortunate enough to catch one of their live performances together in 2012 will already know how these two performers work VERY well together. The first striking feature of the CD is the artwork, which is cleverly themed, well thought out and overall very impressive. Next, onto the music itself. Those familiar with Giltrap and Wakeman as solo artistes will know that their music can be very diverse; a solo Gordon Giltrap acoustic set can on one hand contain a reflective piece of music such as "Em's Tune", and then finish with the full-blooded power and intensity of "Lucifer's Cage". Well more of the same here too, as this 13 track CD consists of a collection of rock songs interspersed with lighter acoustic pieces. It opens with the excellent "Moneyfacturing", featuring the full band sound, followed by the reflective "Fiona's smile", an acoustic track which is already well-known to Giltrap fans. The contrasts continue all the way through the CD ,which reflects the "Ravens and lullabies" theme. As you would expect from these two musicians, all of the material is strong in its own right whether individually or jointly written and certainly Wakeman's lyrics are meaningful, and I suspect somewhat personal. The playing too is top-notch - Wakeman equally impressive on synthesisers and piano, while the electric guitars of Giltrap are powerful and expressive, and may come as a surprise to those more familiar with his acoustic work. There is a worthy supporting cast too - vocals are provided by Paul Manzi (Arena) and Beniot David (Yes), with Steve Amadeo on bass. Special mention must go to Johanne James (Threshold) on drums, whose playing is always very robust and yet precise, and contributes much to every track he plays on. The album was recorded and mixed by "Threshold" guitarist Jarl Groom - good job done here too. For me the highlights of the CD are "Moneyfacturing" and the EPIC "Is this the last song I write", although standards are high throughout and there are many instances of musical excellence, in fact too many to mention here. For those lucky enough to purchase the limited edition package, the bonus CD includes live recordings from the Giltrap and Wakeman 2012 tour plus some new studio recordings. The live material is well-chosen and provides a good representation of those excellent gigs from last year, while the studio recordings include Wakeman's fine "The Forgotten King" and a stunning version of "Roots" from Giltrap's "Fear of the Dark" - fast rewind back to 1978!!! Some might say that this was an ambitious project to undertake - after all, Gordon Giltrap and Oliver Wakeman are still relatively new to each other and it's a long time since Giltrap's prog rock days. Question is do they pull it off? Well in my opinion yes they do in fine style! To conclude this well-crafted offering deserves recognition and success. Let's hope it marks the beginning of a long and fruitful partnership too! BUY IT! 5* Review by PiW on Amazon.co.uk Virtuosic piano, virtuosic guitar. An album for people, who appreciate the highest class of virtuosic guitar and piano (you will love the instrumental compositions). The songs: intriguing vocals and melodies that sound in your ears long after the CD stopped playing. For those into the good, old progressive rock - some parts may remind you of YES and early Genesis (surprised?). 5* Review by Graham Sutherland on Amazon.co.uk What a fantastic collaboration! An incredible collection of tracks. I am a long-time GG fan who still likes Fear of the Dark and Perilous Journey at full volume and this is most definitely a full volume album. That's not to say that there are not beautiful under-stated and low key tracks but there are melodies and songs that scream 'turn me up'. Moneyfacturing is a great opener and Ravens a luscious final song. Inbetween there is the glorious Wherever There Was Beauty and the maddeningly too short Anyone Can Fly featuring solo keyboard and guitar in an incredible last two minutes. If you get the bonus cd then you are in for more treats from some live and studio tracks. I guarantee you that if you like early GG you are going to love this. I'm new to OW but you just have to see this guy play to recognise talent. He writes some great tunes too! Buy it. 5* Review by SEA4 on Amazon.com Outstanding Debut Pairing! This is the first time Gordon Giltrap and Oliver Wakeman have recorded an album together, but they each have an exceptional musical heritage that is put to great use here. Gordon's unique and brilliant guitar work and Oliver's masterful keboard playing complement each other perfectly. The main CD has many pieces worthy of mention including Turn of the Card, Maybe Tomorrow, Wherever there was Beauty, Anyone Can Fly and Fiona's Smile. The Bonus CD, that is included on the Limited Edition pack, is as strong as the main CD with Natures Way, Isabella's Wedding, On Camber Sands and outstanding arrangements of both Bach's Praeludium and Roots an earlier work by Gordon. Get the Limited Edition while you can! When I became aware of the collaboration between guitarist Gordon Giltrap and keyboardist Oliver Wakeman, I was very surprised. While listening to the music on Ravens & Lullabies it unmistakably showed who are playing on it. The typical sound of both musicians can be heard throughout the album: Giltrap's excellent playing on the acoustic guitars and Wakeman's fine keyboard sound which provided him a temporary membership of Yes and Strawbs. However, strangely enough the album was never intended to be a duo album. Early 2012, Giltrap contacted Wakeman with a request for doing some keyboard services for an album idea he had. Within 24 hours the initial idea had changed beyond recognition and a full-blown musical partnership was in the making. At first I was a bit afraid that the music on this album would sound similar to the music on From Brush & Stone (2009), a duo album by Giltrap and Rick Wakeman. This was a rather mellow and a bit disappointing album. I guess Rick's son Oliver had some musical ideas that fit better to the music written by Gordon Giltrap. At some points Ravens & Lullabies reminds me of The 3 Ages Of Magick (2001), an album Oliver made with Steve Howe(Yes). On this album I heard for the first time that Oliver's playing was quite similar to the way father Rick touches the keys. On Ravens & Lullabies you can hear the same kind of MiniMoog sounds. Songs as Moneyfacturing and From The Turn Of A Card are good examples showing clearly that Oliver and Rick have the same musical genes. However, there's also a strong resemblance in the way they play the piano. Listen for example to pieces like LJW and A Mayfair Kiss and you know what I mean. The compositions prove that the album wasn't made to show off otherwise they wouldn't have asked other musicians to contribute. By doing so the album contains a lot of variety. Especially the lead singers were a good choice with main vocalist Paul Manzi, who was a member of the Oliver Wakeman Band for the last six years. He appeared on the live DVD Coming To Town (2008, see review) and he currently is the lead vocalist for Arena. The album also features a special appearance by Benoit David on From The Turn Of A Card. He was Oliver's old band mate with Yes. This track was written by Oliver Wakeman during the Yes recording sessions in 2010. Furthermore there are guest performances from bass player Steve Amadeo, who's currently performing with blues guitarist Aynsley Lister. On drums you'll hear Johanne James who has been with Threshold for the last twelve years. As far as I'm concerned, the album doesn't contain any special favourite songs. All of the compositions are outstanding and worth listening to whether they're mellow, up-tempo, instrumental or vocalized. Raven's & Lullabies is a thirteen-song collection of hard hitting memorable rock pieces coupled with thought provoking lyrics alongside acoustic duets featuring fine instrumental interplay. I think that's the best way to describe the album. It's available in two formats: a single CD featuring thirteen new pieces and a double pack special edition containing a bonus CD with live recordings from their 2012 tour and re-recordings of pieces from both musicians' back catalogue. Two musical powerhouses in their respective fields, guitar maestro Giltrap and keyboard supreme Oliver Wakeman combine their considerable talents on this magnificent concept album on Esoteric. With Giltraps effortlessly beautiful playing and Wakemans beautifully fluid keyboards, any album with one of them on is a joy; with them both together you’re getting a masterclass in collaborative performances. With Olivers vocalist of choice the incomparable Paul Manzi on board (seeing Oliver and Paul perform together sends shivers down your spine) and with Wakeman and Giltrap trading licks, exchanging riffs and building things of beauty around each others talents, has to be heard to be believed. This album is a thing of great power and great beauty and is one which you’ll find you keep returning to again and again, and each time you’ll discover something new, one of the best albums either man has put their name to, and this is one of those collaborations you hope continues.